For a long time, the real estate market has been a male-dominated field. Brokers, engineers and realtors were believed to be job titles that could only be held and managed by men. This was held as a belief and an unspoken rule for a very long time. However, this belief has been refuted repeatedly over the years; now, it is not unusual to hear names of famous pioneering women in real estate and architecture fields who left their everlasting signature. This focus on women empowerment and enablement has been recently reflected in all the fields and industries out there, not just the real estate or engineering fields. Every day, another woman would rise to become one of the best in her own field – be it a sport, an art, or an industry – and earn well-earned prominence for proving once again that women can successfully fill any shoes that men can. That being said, the success of women in real estate has gained much fame worldwide as the impact of this success can be seen firsthand in modern wonders of architecture and luxurious projects that could easily leave its visitors in a mesmerized state, especially in the major tourist attractions and futuristic cities around the world. 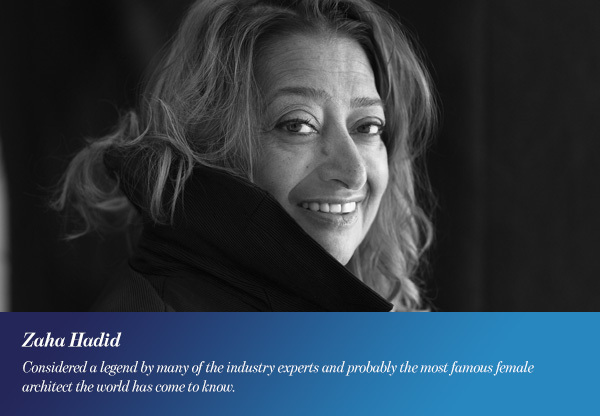 Hadid’s most renowned achievement, however, is probably the fact that she is the first and, so far, the only woman to be awarded the Royal Gold Medal from the Royal Institute of British Architects. In addition to that, she was the first woman ever to receive the Pritzker Architecture Award in 2004. Hadid also won Stirling Prize, Uk’s most prestigious award of the field, two consecutive times in 2010 and 2011. If you visited any of the major metropolises of the globe, the chances are you would walk across one of her stunning works. Zaha Hadid’s portfolio comprised masterpieces and landmarks spread all over the globe including London Aquatics Center in London, Uk, Al Wakrah Stadium in Qatar which is being built for World Cup 2022, Strasbourg Train Station in Strasbourg, Germany and other projects that are too many to be listed here. Zaha Hadid passed away in 2016, but her legacy will live on for a very long time. As a matter of fact, some of her projects are still under construction right now. There is no doubt that Zaha Hadid has reshaped the perceived image of women in real estate and architecture. 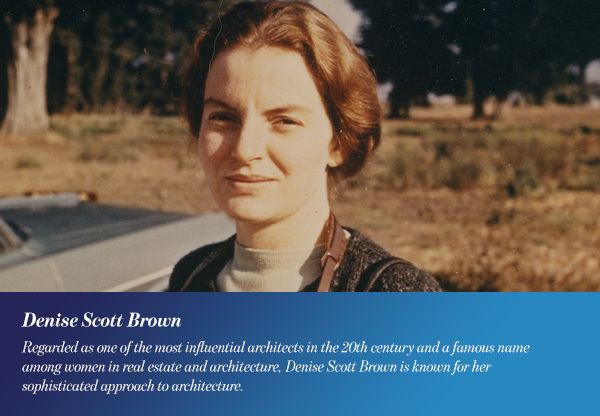 Regarded as one of the most influential architects in the 20th century and a famous name among women in real estate and architecture, Denise Scott Brown is known for her sophisticated approach to architecture. Brown is renowned for creatively blending eastern and western ideas while taking into careful consideration variables like the social, economic and cultural norms of the area in which the project is being developed. She is known for her systematic approach to her project that is known as Form, Forces and Function (FFF) Studios. In the aforementioned approach, Brown argues that architects cannot afford to ignore the social forces and natural conditions of the cities where their projects are situated because of their impact on the design patterns of the cities. As an advocate for women in real estate and architecture, Denise Scott Brown is famous for an essay she published that is titled “Room at the Top: Sexism and the Star System in architecture.” In that article, Brown addressed issues that were considered as the elephant in the room for women in real estate like sexism and the hardships and obstacles she had to overcome to be recognized as an equal partner in her firm. The topic was so much of a taboo that, although Brown wrote the article in 1975, she only published it in 1989 as she feared the damage the essay might inflict on her career. For that reason, Brown is praised by many of her colleagues and students for being one of the bravest women in the industry. 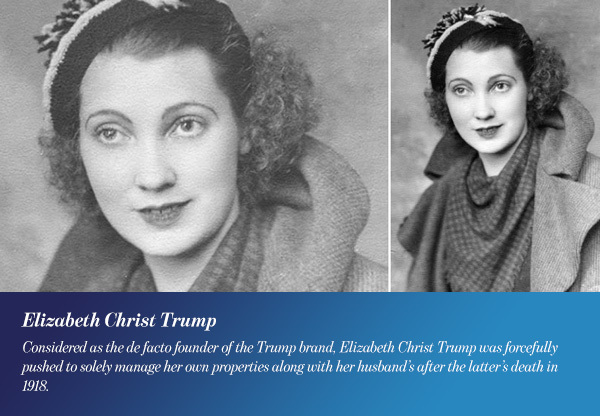 Considered as the de facto founder of the Trump brand, Elizabeth Christ Trump was forcefully pushed to solely manage her own properties along with her husband’s after the latter’s death in 1918. The German-American businesswoman went on to found the real estate development company Elizabeth Trump & Son, the entity that is known today as The Trump Organization and is now owned by her grandson Donald Trump, the 45th and current president of the United States. Although she died more than 50 years ago, Trump’s successful management of her and her son’s properties is still resonating throughout the world till today as it did not only lead to the cementation of her company as one of the most powerful real estate companies in the last 100 years, but also, eventually and indirectly, impacted the whole world. 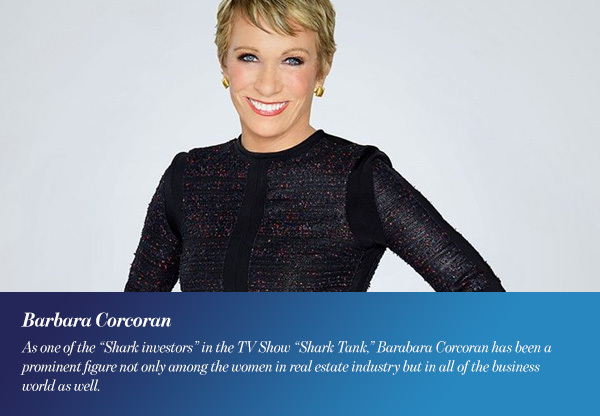 As one of the “Shark investors” in the TV Show “Shark Tank,” Barabara Corcoran has been a prominent figure not only among the women in real estate industry but in all of the business world as well. Corcoran is a self-made businesswoman; in 1973, she started her business, The Corcoran Group, with a $1,000 loan she borrowed from her boyfriend when she used to work as a waitress. Fast forward to 2001, Corcoran sold the group to NRT Incorporated for $66 million. Corcoran’s influence is not restricted to the companies she is currently investing in only; she is a columnist for multiple successful magazines. She also authored many books on real estate and, ever since the 1970s, she began publishing The Corcoran Report, in which she provides her insights on the real estate trends and data. 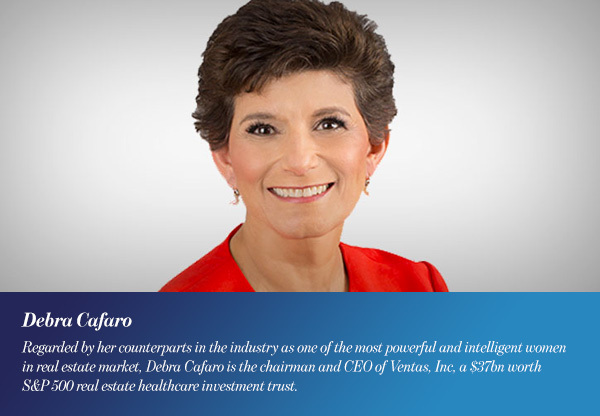 Regarded by her peers as one of the most powerful and intelligent women in real estate market, Debra Cafaro is the chairman and CEO of Ventas, Inc, a $37bn worth S&P 500 real estate healthcare investment trust which has healthcare properties situated across the United States, the United Kingdom and Canada. Cafaro’s wits and genius are reflected in the mark she left on Ventas. Back when Cafaro joined it as CEO in 2000, Ventas was facing a dire financial crisis that pushed it to the verge of collapse. From there, Cafaro led the company’s turnaround to become one of the most influential real estate companies. Under Cafaro’s leadership, Ventas was chosen as the most successful financial publicly traded company for the past decade and was voted as one of the world’s most admired real estate companies by Fortune magazine. In a manner of speaking, Cafaro was the silver bullet for Ventas, Inc. Among many recognitions and awards she received, she is one of only 23 CEOs to be named by Business Harvard Review as one of the best performing CEOs around the world for four consecutive years. There is no doubt that women are continuously breaking the taboos developed around the industries which were believed to be men-only clubs for a long time. Thus, it is safe to say we will continue to hear of prosperous women in real estate and all the other industries as well.